It was ugly at times. The Carolina Panthers opened the 2018 regular season by painting their logo at midfield for the first time in franchise history, instead of the NFL shield. Then, with new owner David Tepper watching, delivered a hard fought 16-8 victory over the Dallas Cowboys that wasn’t as close as the score appeared. The Panthers defense was in mid season form, sacking quarterback Dak Prescott six times and limiting Dallas to 232 yards. Prescott never really got into any sort of rhythm with his wide receivers, finishing with just 170 yards passing. Cowboys RB Ezekiel Elliott was held to 69 yards rushing on 15 attempts by the Panthers defense and didn’t score until the fourth quarter. That would be the third-lowest rushing output for Elliott in his career. Dallas’ WR Cole Beasley, had seven catches for 73 yards. The Cowboys did not cross the 50 yard line on any drive until the 2nd half of the game. Panthers QB Cam Newton finished 17-26 for 161 yards, 13 carries for 58 yards. Newton scored a rushing touchdown in the second quarter, his 55th career rushing touchdown. Newton has more rushing touchdowns than any quarterback in NFL history. Luke Kuechly had 13 tackles to lead the Panthers. Kuechly briefly left the game late in the 4th quarter with an apparent injury but returned on the next drive. The Panthers got pressure from their interior of their defensive line on Sunday, Kawann Short notched 2 sacks, he now has 31.5 career sacks, the most of any defensive tackle in Panthers history. The Panthers drove the length of the field on their opening drive, marked by two key runs by Cam Newton off of run/play option (RPO). Once deep into the red zone, RB Christian McCaffrey lost a fumble inside the five-yard line. It marked his first lost fumble since Week 1 of 2017 at San Francisco. McCaffrey finished with 16 touches (10 rushes 6 receptions) for 95 yards from scrimmage. The Cowboys did get on the board in the 2nd Half, as Elliot ran in from the 4 yard line off a option pitch from Prescott. The Cowboys converted the 2 point conversion to turn the game into a one score affair. 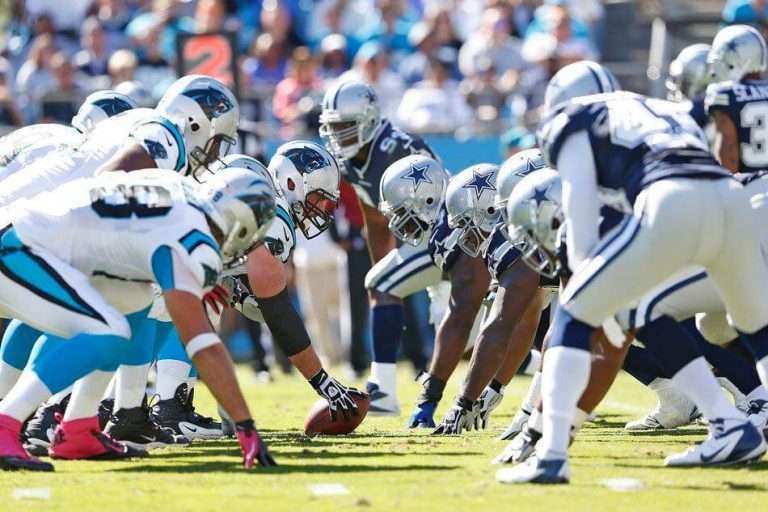 Dallas final drive ended when Panthers defensive tackle Mario Addison added a game-clinching strip-sack of the Cowboys quarterback with 1:23 left to seal the victory. Dallas was penalized 10 times for 85 yards. The Panthers may have gotten the win, but suffered from key injuries during the game. TE Greg Olsen injured his foot in the 1st quarter and did not return to the game, instead returning to the sidelines in a walking boot. It is the same foot Olsen broke early in the 2017 season that caused him to miss 9 games. No word on the extent of Olsen’s injury. For the Cowboys, Defensive End Randy Gregory suffered a concussion after running into a Cowboys defender in the backfield while pursuing Newton. Gregory did not return to the game. Pro Bowl RT Daryl Williams, who had missed most of the preseason with an MCL injury, went down with a knee injury in the 4th quarter when a Dallas Cowboys defender fell into his knee. Williams was carted off the field. The Panthers travel to Atlanta to take on the Falcons next Sunday, kickoff at 1pm. The Game will be carried by Fox.